This entry was posted in Food and tagged Diet, Dr. Colin Campbell, Food Inc, Forks Over Knives, Meatless Monday, Vegan, Vegetarian. Bookmark the permalink. Hurray for you! 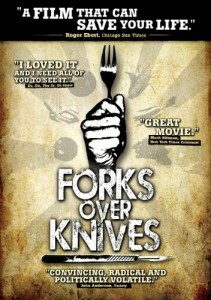 I was already vegan when I saw Forks Over Knives, but I know that it’s a life changer for many. I’m in it for the animals, but am happy with all the health benefits that go along with skipping the meat.